a yellow balloon will list the events that have been queued and deferred by the current state. The age of the event and whether they have expired or not, will also be shown. 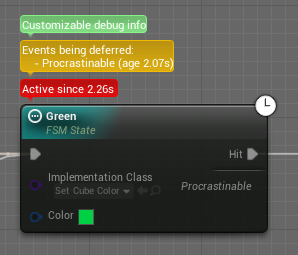 a green balloon will display user-customizable debug information about the state. This is available only if the state has an implementation class and the class overrides the GetDebugInfo function. 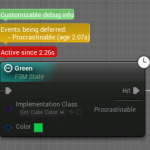 During debugging only, the GetDebugInfo function will be invoked every frame while the state is active. If the returned string is not empty, the green balloon will show up with the string contents.